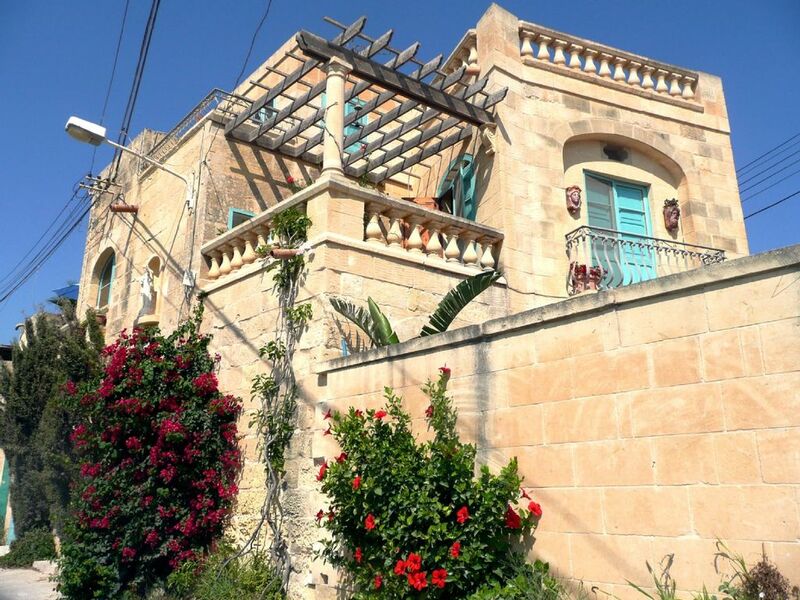 Mistrieh il Hamien (The house of the Resting Doves), is a beautifully restored authentic, luxury farmhouse perfectly located on the edge of the village of Qala,in the sunny island of Gozo. With far reaching rural and sea views across to Comino and Malta, the house is reminiscent of a small medieval castle with a sweeping limestone staircase as you enter into a covered courtyard with a working well. There is a stylish mill room/lounge with an Apple TV box for streaming and a wood burning stove which leads into a large ,fully equipped kitchen/dining room seating up-to 10 people - perfect for families and entertaining. The kitchen leads onto the walled garden with eating area and swimming pool .There is also a WC on this floor. Up the sweeping staircase are two terraces with lovely views and another seating area which has two large double bedrooms and one twin bedroom leading off it. All have ensuite shower rooms and ceiling fans. Linens are house towels are supplied . All three bedrooms have ensuite shower rooms with wash basin and toilet. On the ground floor there is a an extra toilet room with basin. Hot water is heated by solar panels. Smoking not allowed in the house but is permitted by out door pool area or terraces. Ashtrays are provided but please leave clean! Although linens and house towels are provided , please ensure you bring your own beach towels. Thank you ! The house has everything you can need, is spotlessly clean and has a wonderful pool. The housekeeper lives very close by and is on hand if you have any issues. There are quite a few restaurants in the village that are easily accessible on foot and Lidl is a ten minute car drive away. The nearest beach is 5 minutes away - numerous others are not much further. The car hire and transfer was all arranged with the owners help and made everything so easy - including the ferry crossing. Gozo is the most beautiful island - there are some really unspoiled bays with crystal blue waters to discover and some amazing scenery. Would highly recommend! Mistrieh il Hamien is a delightfully unique villa, ideally situated on the island of Gozo. It is within easy walking distance of the town of Qala which has all the amenities you might need and yet the villa is in an idyllic setting. The villa is very well equipped for those who wish to cater for themselves, with an abundance of pots, pans and electrical gadgets. The bedrooms are light and airy and all have their own en-suites; which is a great bonus, plus the beds are very comfortable. There is plenty of seating in the lounge; which was wonderfully cool during the heat of the day. On arrival the house keeper had provided some essential foods to tide us over and was there at hand to greet us and answer any questions we had. There is an ample choice of restaurants in the centre of the village, all offering varied menus, generally good value for money as the portion size was always generous.There is also a restaurant just along the road from the villa which offers a range of traditional dishes but at a higher price to those in the village centre. As the villa is within easy reach of the ferry port it quite possible to cross over to Malta for the day, should you wish. However the peace and quiet and relaxed pace of life on Gozo can't be beaten. I would have no hesitation in recommending this villa to family and friends. May not be suitable for those with disabilities. Mistrieh il Hamien is indeed a unique and a lovely house, I am glad that you appreciated it and had a good time. Having just returned myself, I am already missing waking up to the beautiful views and sunny Gozo skies ! Close by are the local shops, restaurants and bars which surround the church square of St. Joseph in Qala. The local beach of Hondoq is also nearby, as is Mgaar Harbour where the ferries go back and forth to Malta each day. The main town is Victoria, which is about a fifteen minute drive away. As the island of Gozo stretches only 9 X 4 miles, there are many lovely bays and beaches , restaurants and places of interest to visit and enjoy. Snorkeling, diving , swimming ,sailing and boat trips to the clear turquoise waters of the Blue Lagoon in Comino are popular pastimes in the heat of the summer months. Whilst wonderful nature walks are perfect in the spring and winter months.